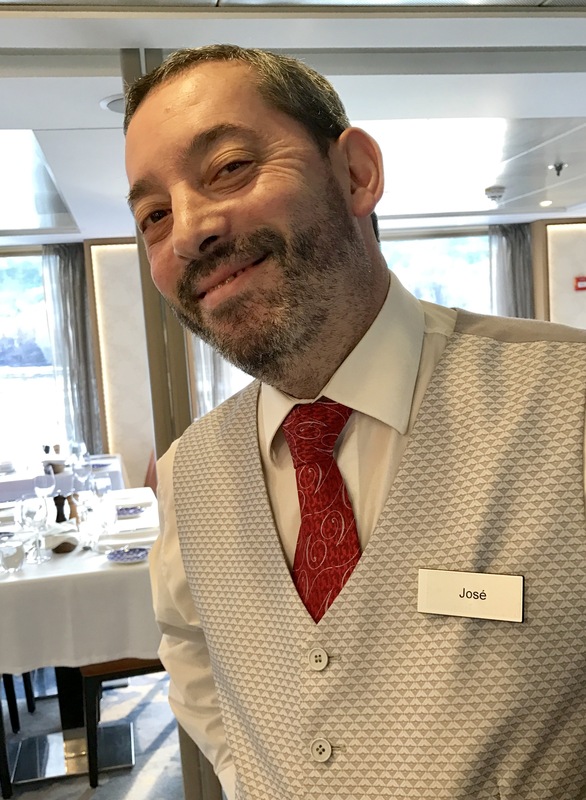 River cruising, luxury sailing on ships smaller than ocean liners, has gained tremendous popularity, especially with the Boomer generation. The desire for adventure and learning is enhanced by what is called “experiential travel” or connecting participants with the history and culture of a destination. The journey includes excursions and interactive workshops in cities and towns strung along the waterway. 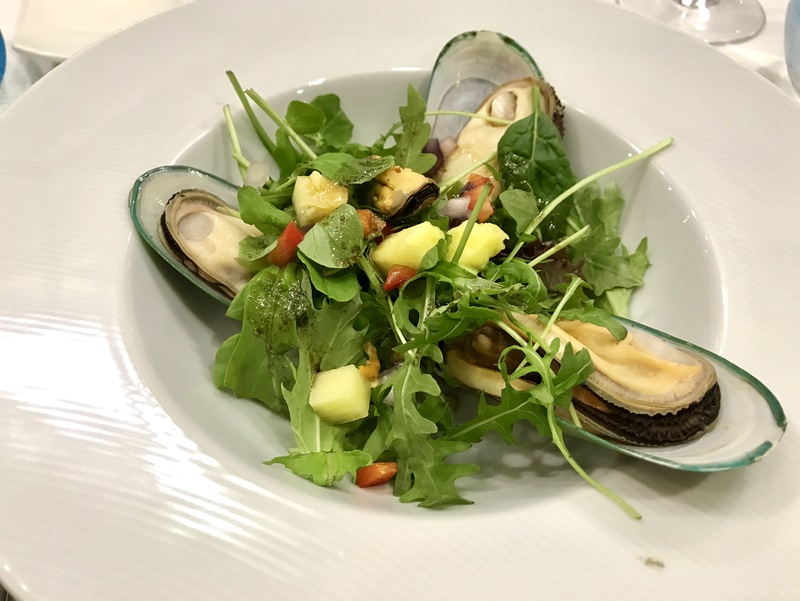 I recently took a Viking River Cruise in Portugal that not only met, but also exceeded those goals. The glorious Douro River Valley. Portugal rests in Southwestern Europe bordering Spain and the Atlantic Ocean. The entire country is only about half the size of North Dakota. My cruise-tour began with a flight into Lisbon, the capital, where I spent two nights in a downtown luxury hotel included in the itinerary. The arrival day allowed travelers to adjust to jet lag and have free time to explore. 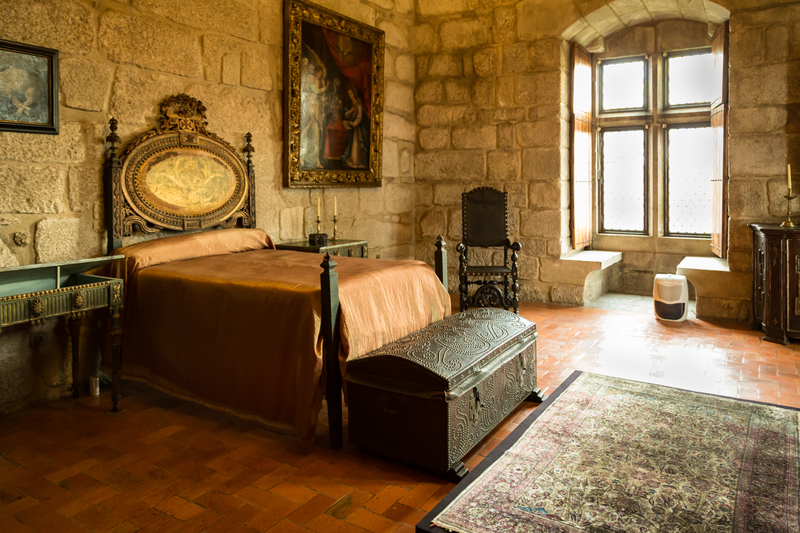 Next morning, complimentary tours to the major historical monuments showcased Portugal’s famous explorers. Lisbon was razed in 1755 by a devastating earthquake; so much of the architecture is 18th-century. The capital city’s charm unfolded within the tightly packed alleyways of the Alfama district, and along the River Tagus, stopping at the Monument to the Discoveries, dedicated to the early Portuguese explorers. It moved to soulful Fado, longing and sorrowful music accompanied by the Portuguese guitar, and tasted of fresh seafood. Fado, the traditional songs of longing accompanied by guitar. After the morning tours, I chose to be left off downtown and found a neighborhood restaurant with local fare and authentic ambiance. I walked back to the hotel and took a brief rest. My afternoon tour included the site that became my favorite venue: the National Tile Museum housed in an old convent and bursting with intricate and historic Portuguese azuelos, blue and white or tile art. The building incorporates an eye-dazzling ornate golden chapel and houses a most surprising work on the top floor. Visitors glimpse the past by studying a 174-foot tiled mural of the city, the best historical record prior to the natural disaster. 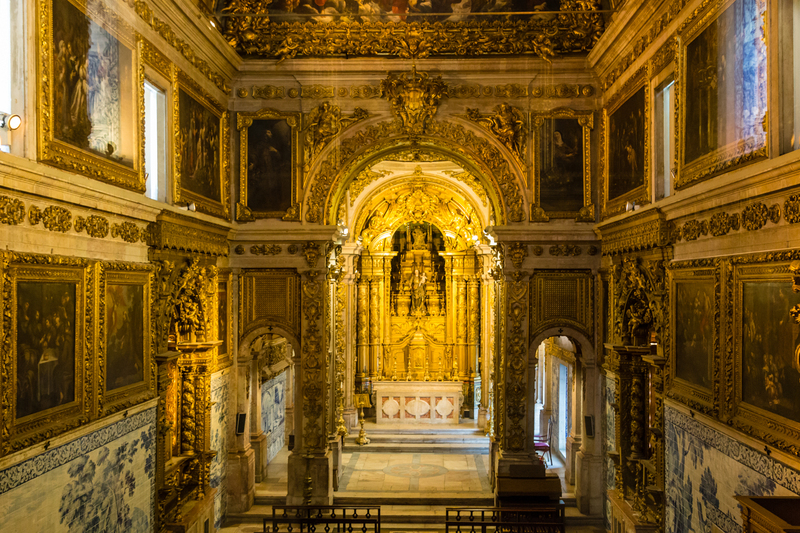 The golden glow in the chapel within the National Tile Museum, Lisbon. Before leaving, I had the opportunity to paint my own tile. It would be fired and returned to me before the end of the cruise. I quickly realized the advanced skills and time necessary to design an artistic piece like those displayed in the museum. Although my work fails to come close to fine art, the personally painted tile makes a lovely memento. 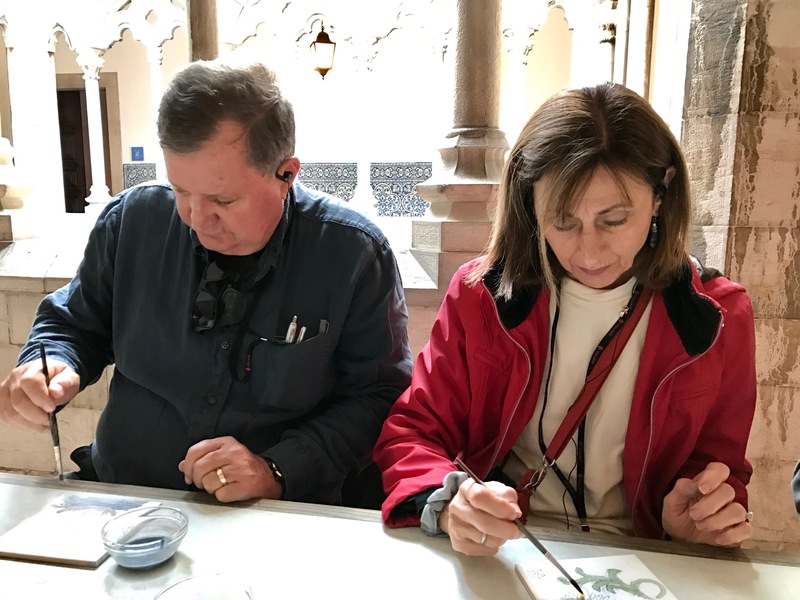 Viking cruise guests participate in a tile workshop in Lisbon. Lisbon served up endless options, but it is often the little towns and villages that result in deeper travel connections. These off-the-beaten-track adventures, accessible on a river cruise, bring unexpected surprises and frequently evoke more powerful memories than the major cities. Next day, the group assembled after breakfast for a bus ride of about 200 miles. We stopped along the way in the town of Coimbra. 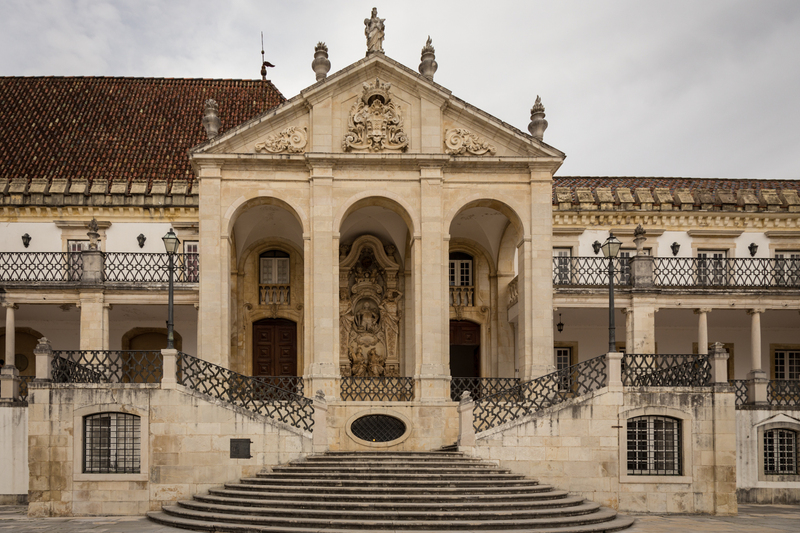 Coimbra is the birthplace of six Portuguese kings and home to one of Europe’s oldest universities. The University maintains one of the most extraordinary libraries ever. Unfortunately, I was not allowed to take any photos to illustrate a story that left me shaking my head in amazement. Twenty-one tiny bats are kept in a cage near the ceiling of the library. The staff releases them every night after the tables and chairs are covered. The bats eat microscopic insects and therefore keep them from damaging the rare books. The use of bats began after the library was constructed in 1728, and remains so effective, it is still employed today. Who would have ever guessed? Exterior of the Coimbra University Library. 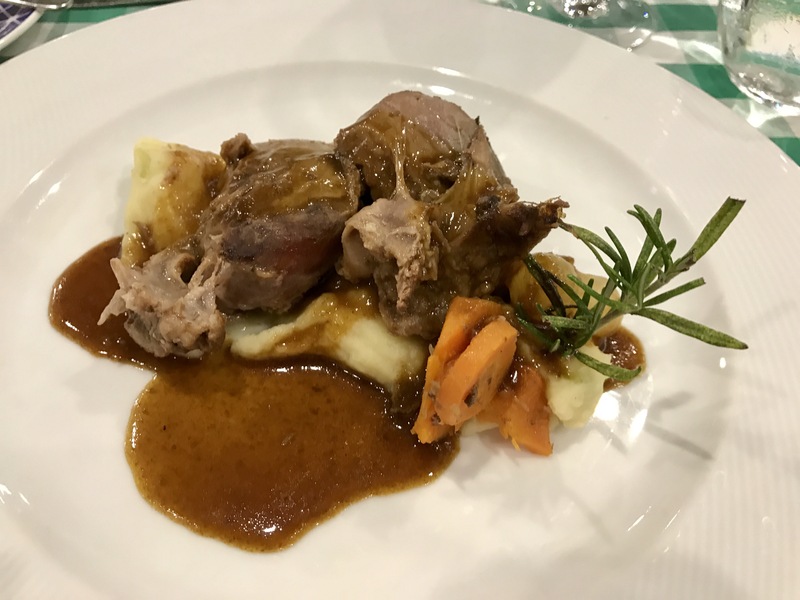 A scrumptious lunch featuring a Fado performance followed and then we returned to the buses and headed for Porto, While riding, our guide introduced and we practiced pronouncing some common Portuguese words like hello, thank you and good-bye. 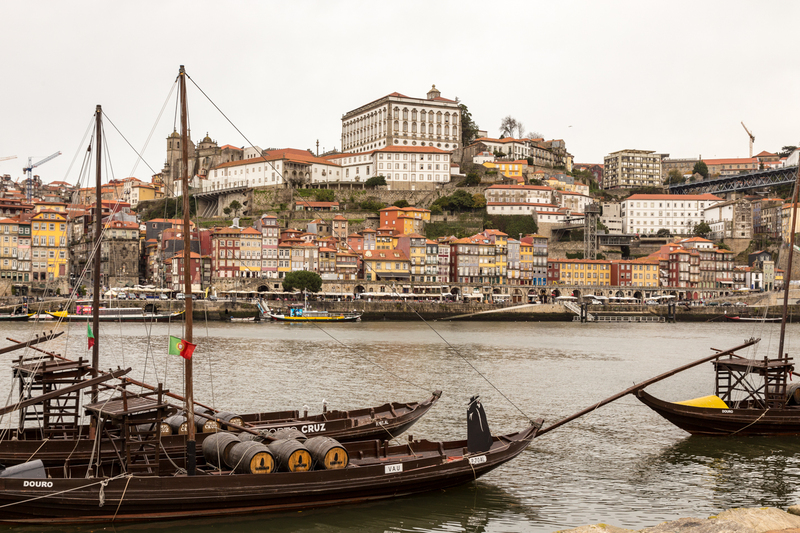 When we reached Porto, the second largest city in the country, everyone boarded the ship docked on the Douro River crossed by many scenic bridges. From then on, we did not have to unpack again, perhaps one of the best features of any cruise. Before dinner, welcome drinks were served in the lounge and introductions of the staff were made. Arriving at the cruise dock in Porto. 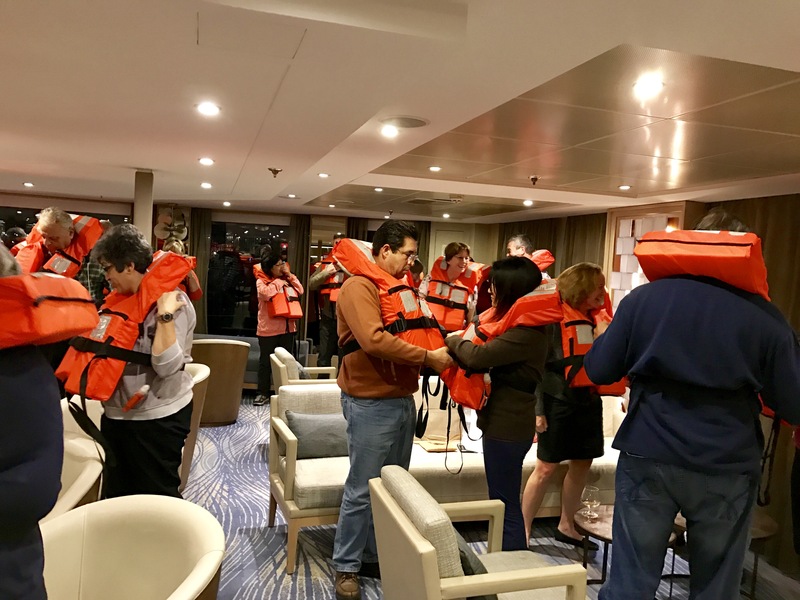 The ship featured an upstairs lounge with a bar that also serves as a central meeting place for briefings, language lessons, special cooking demos, and cultural lectures. The outdoor deck area is outfitted with lounge chairs, solar panels, an organic herb garden, and the ship’s wheelhouse. It’s collapsible for those times when height clearance is critical for structures like bridges. Safety drills in the lounge. The Viking Torgil serves a maximum of 100 guests per sailing. The staff is predominately Portuguese spoke good English and were very proud to share their country with guests. River cruise ship, the Viking Torgil. The large dining room seats all onboard at one time. 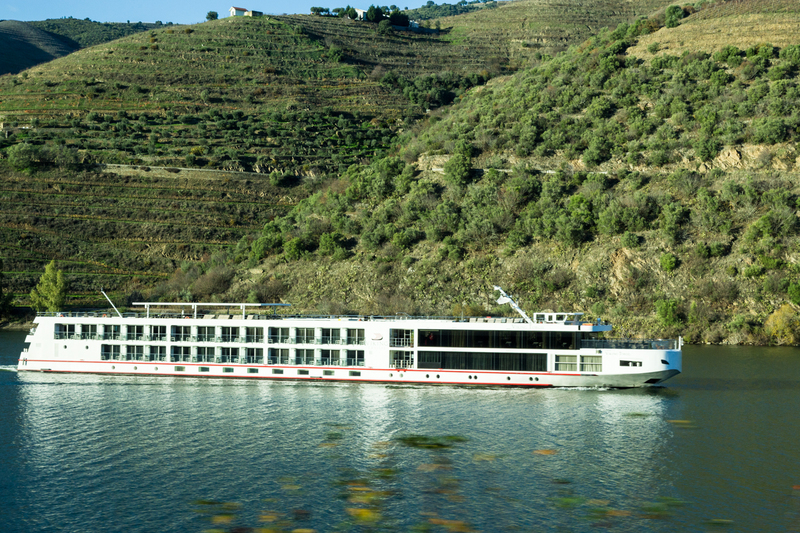 Viking River Cruises include all meals plus wine or beer and some dinners took place off ship – in a monastery and winery. Open seating encouraged camaraderie amongst cruisers and groups formed over the course of the journey. A 24-hour coffee/ snack station allows self-service when desired. Yummy pastries and Portuguese custard tarts were frequently offered. Dinner began with an appetizer plate of mussels. Splendid slow-roasted boar served on the Viking Torgil. My Veranda stateroom included an extremely comfortable bed and linens and lots of built-in drawers and a closet for clothing. The room felt airy, not too cramped like many ships, and best of all included a floor to ceiling sliding glass door leading to the balcony. The bathroom held a roomy shower with good water pressure, space to store toiletries and a hairdryer. A mini-refrigerator, big-screen TV with complimentary On Demand movies, and Wi-Fi were also included. 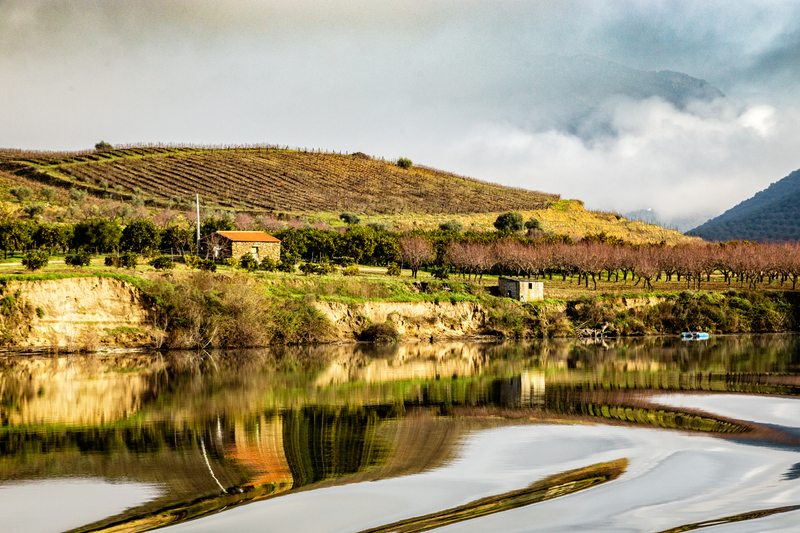 The Douro River has been the historical lifeline through the region, nicknamed the River of Gold. It’s the world’s oldest demarcated wine region, a designation similar to the official champagne boundaries. Wine has been produced there for two thousand years making it the golden currency that sustains the area. 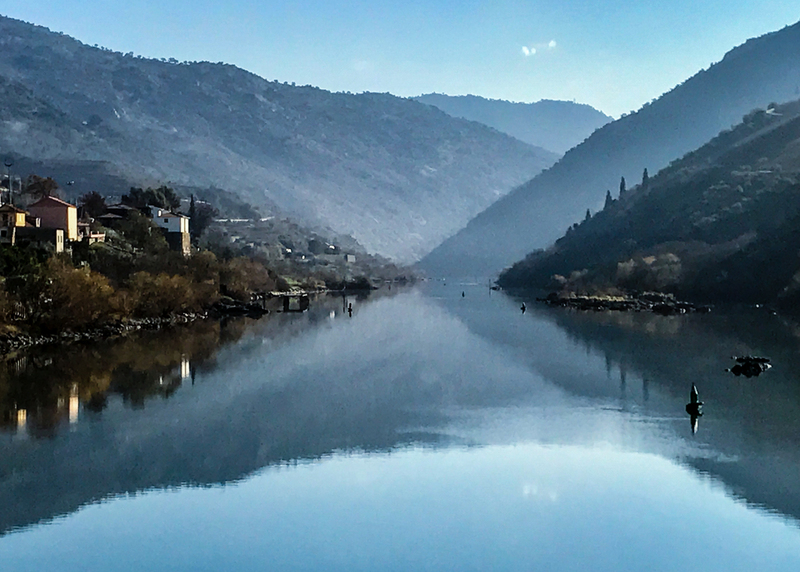 The Douro is a narrow waterway with magnificent gorges and steep banks, perfect for photographers and those who wish to sit back and simply bask in the view. Terraced wine estates called Quintas dot the hillsides. Nowadays, the river contains many locks that enable ships to move faster and safer. Because of these locks, boats never travel at night; so, on this cruise, all sailing occurs during daylight. As background for our outings, Viking’s Program Director introduced us to the area’s history through a slideshow presentation. Learning the history of the region and cities we’d visit and about the local cuisine was provided during daily on-board presentations. Nearly all passengers attended and considered these an added value. Additional, on- site guides and the use of headphones reinforced what we’d learned. Trust me, understanding the production of port took a few lessons to fully grasp. Exploration of Porto’s Cathedral and other historic properties happened the next morning. 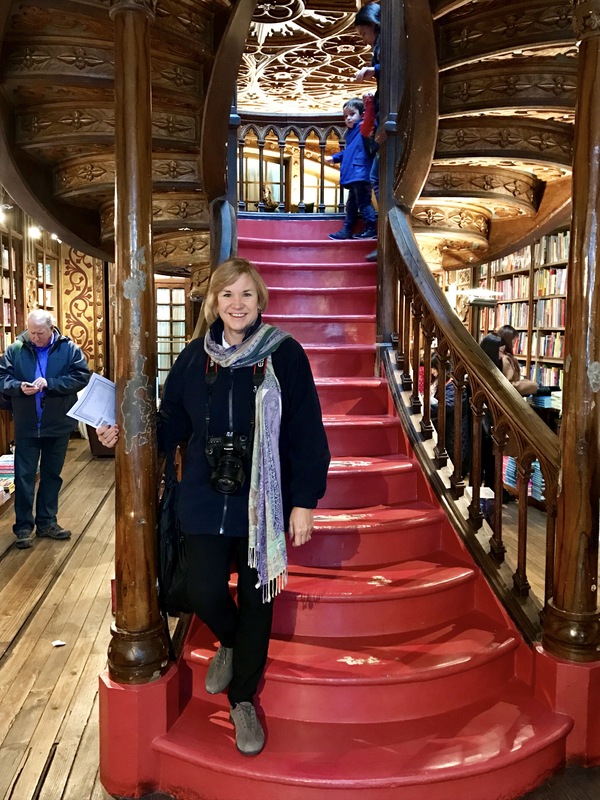 I adored the Lello Bookshop with staircases that inspired RK Rowling. Later, we took a tasting tour through the wine cellars of a port wine producer. 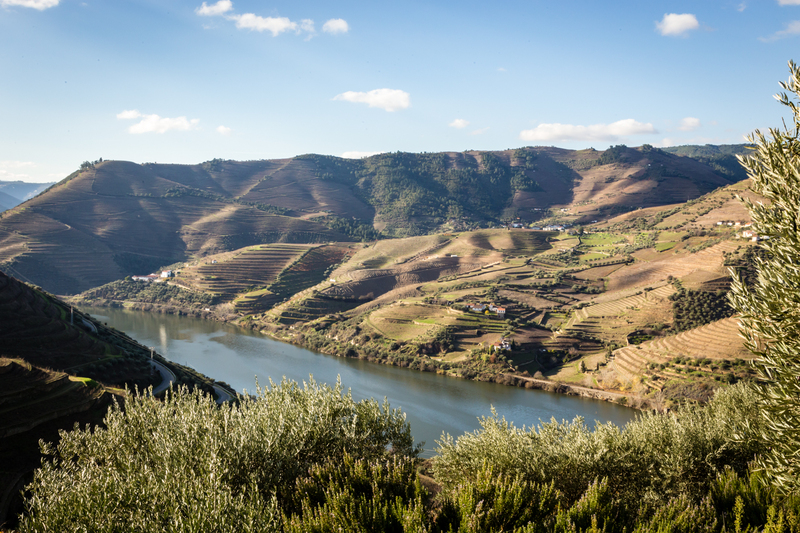 All fortified wine called port comes from the Douro Valley. Many warehouses line the river stacked with barrels of aging port. The magnificent staircase in the Lello Bookshop, Porto. That afternoon I signed up for an optional excursion to Guimarães, a UNESCO World Heritage Site. Envision a medieval quarter with narrow streets, a main square and palaces and monasteries dating back to the 10th century. In the 12th century, it became Portugal’s first capital and home to its first king, Afonso Henriques. The following day we cruisers took a scenic bus ride past many terraced vineyards facing the river and traveled up a switchback road on a mountain in Régua. Once at the summit, we had glorious, as far as the eye can see, panoramic views of the landscape and river below. 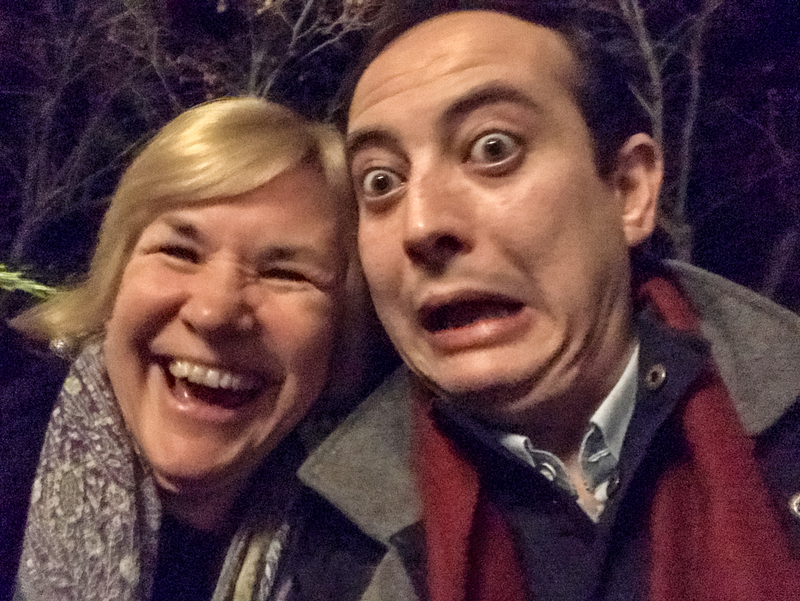 The Sandeman Wine Estate was toured and naturally included another tasting of port, all in the name of learning- right? 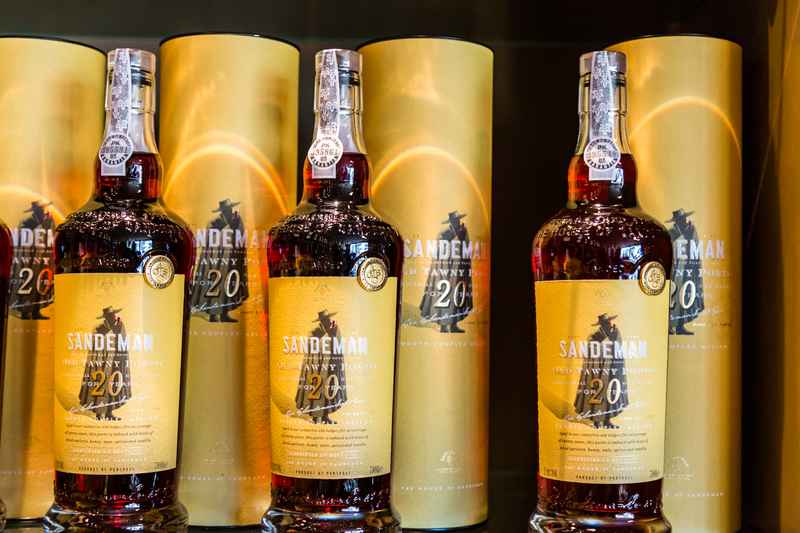 Specialty ports from the House of Sandeman. Afterward, we retraced our bus route and proceeded onward to explore the baroque Mateus Palace. You might recall its picture on the odd-shaped bottles of Mateus wine that were popular in the 1970’s. My group started in the formal gardens featuring cedar-lined walkways, exquisite sculpted hedges and statuary and ponds. A guided tour through the main house with its iconic-pinnacled facade, grand stairway, richly appointed interiors and priceless objects followed. Others from the group followed a reverse itinerary. The palace is still inhabited by the family who remain great benefactors of the arts. I was not permitted to take photos inside, but let me say the woodwork was some of the most beautiful I have ever seen. Afterward, we were bused back to our ship, the 262-foot Viking Torgil, however, it had moved while we were off on our excursion and was now docked further upriver. The ancient fort at Castle Rodrigo. 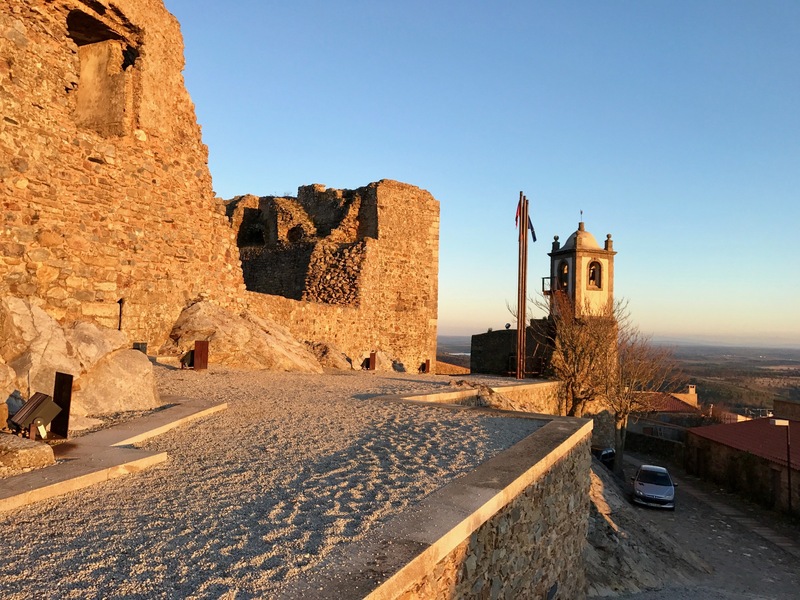 Another day, we were transported to the UNESCO World Heritage site of Castelo Rodrigo, a tiny medieval fortress village with narrow streets and houses with 16th-century facades. The hilltop community includes a historic church, the remains of a Jewish community established by refugees escaping the Spanish Inquisition, and a few shops selling upscale merchandise mainly for tourists. They featured Portuguese-made cork products like wallets, handbags and even shoes. This small country produces about half the world output of commercial cork, and its exports over recent years have accounted for around 70 percent of world trade. Almond groves are also renown in this area. They grant glorious fields of white landscapes to those who visit during spring. Many of us purchased numerous varieties of flavored almonds from the nut shop as gifts to take home. Short cooking classes are a part of every Viking cruise and I attended one to learn to make the traditional Portuguese custard tarts. The pastry chef gave this lesson and shared the recipe. 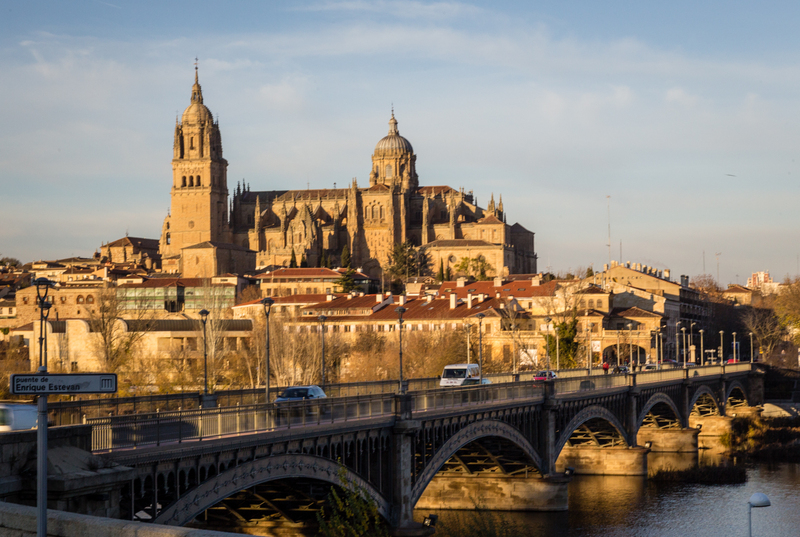 When our vessel reached the border of Spain, we rallied for a full day trip into the city of Salamanca, a living museum dating back to the Middle Ages; yet it is also a cosmopolitan and multicultural city. This famous university town contains many building constructed from sandstone that shimmer with a golden glow, especially in the afternoon sunshine. The Old Cathedral dates from the 12th century and the New Cathedral is hardly new- built from 1513 through 1733. Viking offered a guided tour of the city, allowed free time, provided lunch and a hotel where passengers could rendezvous and wait if they were tired. I chose to climb up many steps of the Cathedral dome capturing a bird’s eye view of the rooftops. As we left the city, the bus hesitated at a spot where I shot this scenic photo. Leaving Salamanca in the late afternoon sunshine. 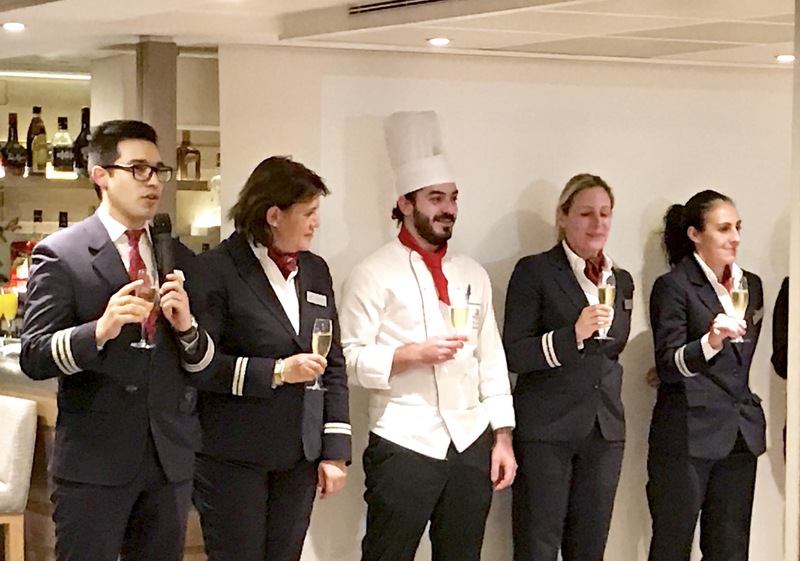 Fog kept the ship from movement one morning, but that evening Viking employees arranged to gala dinner at a winery in the little village of Favaios. Bread came from one of the last traditional bakeries in the Douro River Valley, a place we were supposed to have toured earlier in the day. The winemaker, a real character who looked and acted like Mr. Bean and Peewee Herman, kept the crowd laughing and dancing. Winemaker looks like Mr. Bean. 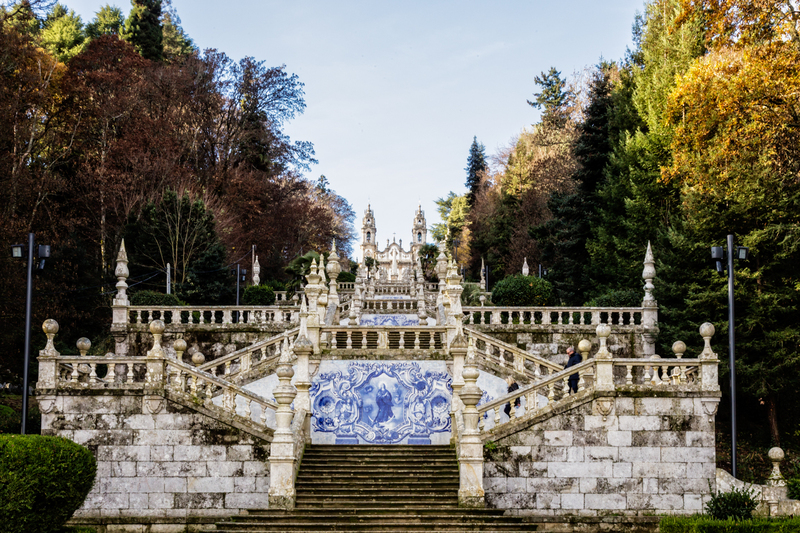 On our final day brought an unforgettable experience for me in the tiny town of Lamego, site of a pilgrimage shrine known for its myths and miracles. Built in 1791, the small hilltop chapel provides dramatic views and a picturesque 686-step double staircase still used by those seeking a cure from Our Lady of Remedies. 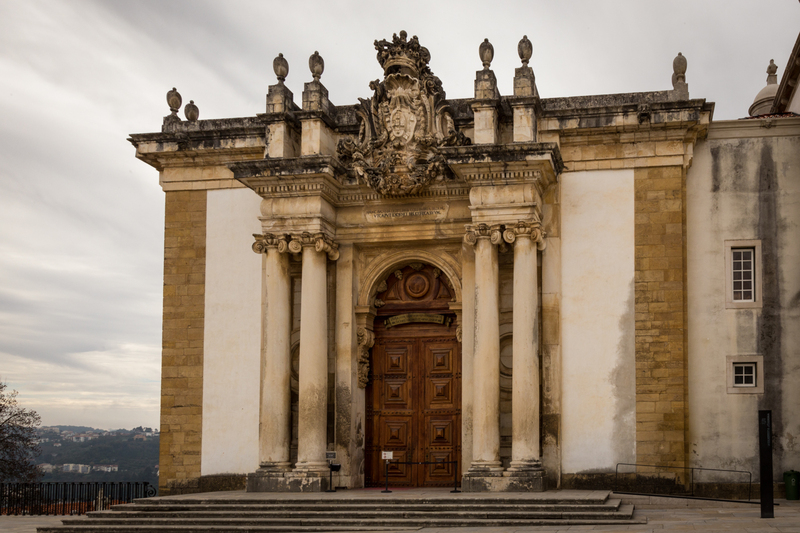 Our Lady of Remedies Chapel in Lamego, Portugal. Before descending, I dallied in the chapel taking photos and was discovered by an elderly nun. She took me aside and showed me a special statue in the back chapel. I stood silently, rooted in place as I felt a divine presence emanating within the room. I believe a sacred place takes on a rarified air from the thousands who come there to pray. I’ve certainly felt this state of devotion in other famous pilgrimage cathedrals like St Peter’s Basilica, Chartres, and Assisi. (Fatima is the most famous pilgrimage church in Portugal, but I haven’t visited.) However, I wasn’t expecting the personal interchange with the nun. Her sweet smile and the piety with which she revealed the treasure were a gift. The parting hug from her deeply connected me with the shrine. She and the love within will stay with me forever. View over the town of Lamego. 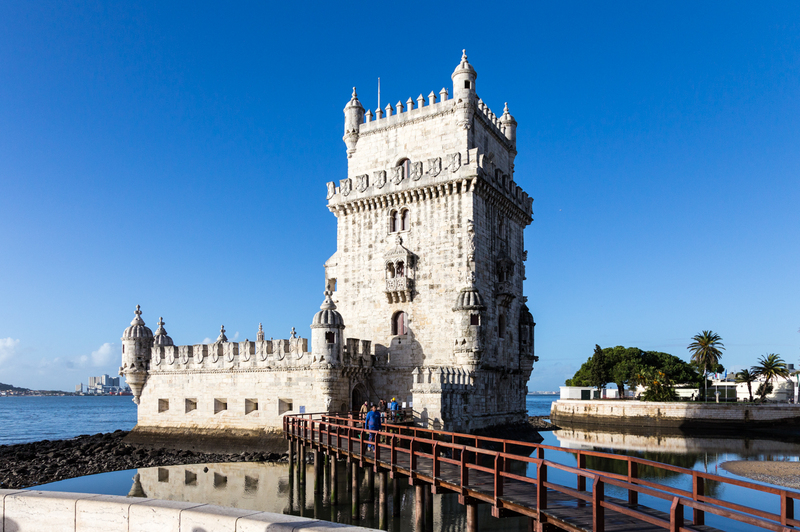 Guided Shore excursions and the Lisbon tours were included at each port of call. 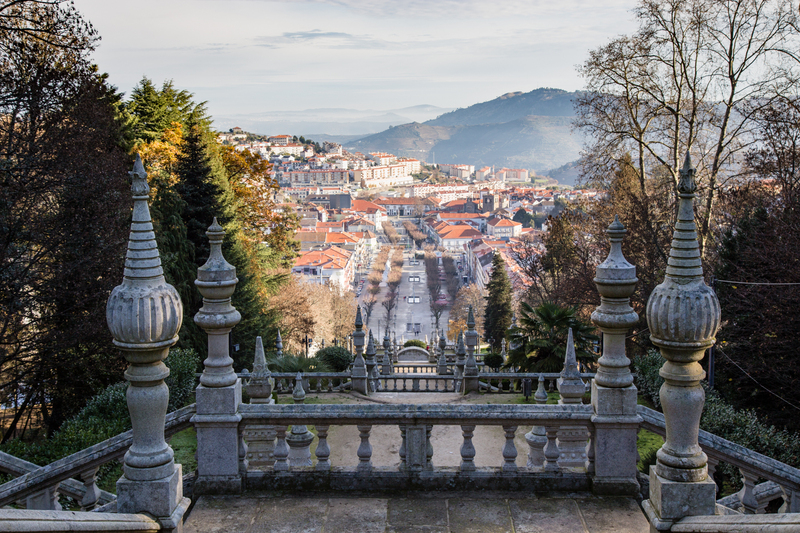 A few optional excursions, such as the Tile Workshop and the trip to Guimarães cost extra. 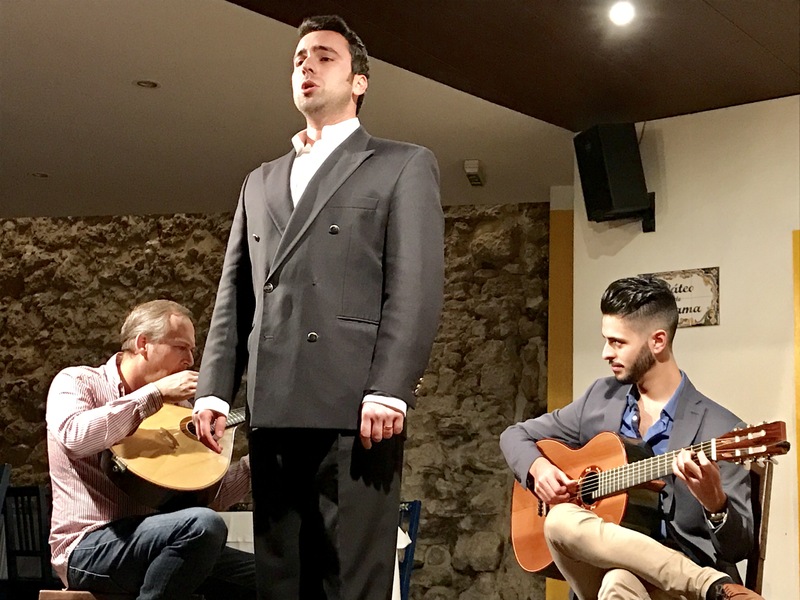 Evening entertainment featured local performers like flamenco dancers, a Fado performance—Portugal’s traditional songs accompanied by three guitars, and a folk dance troupe. The Viking staff went out of their way to accommodate everyone’s needs and were always available to solve a problem. Arrangements were made to accommodate those who had trouble keeping up with the walking tours. I cannot say enough about the extraordinary level of service. 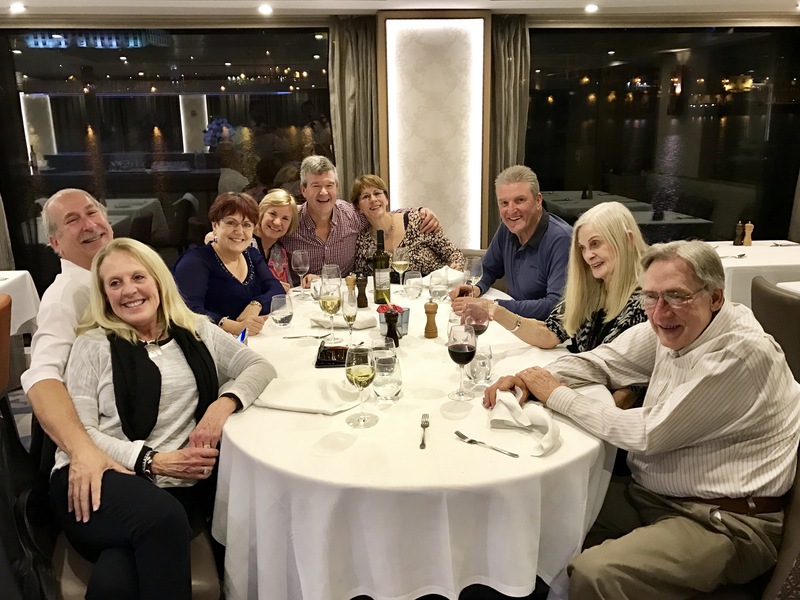 Dinnertime is fun time on a Viking cruise. Many friendships developed over the cruise and some were already planning future cruises together. By the time I flew home, I had indulged and embraced the people, culture and cuisine of Portugal. I acquired new friends from across the U.S. and the UK that I plan to stay in touch with through social media. I had a worry-free vacation and would heartily encourage others to consider a Viking River Cruise. The Viking staff are always smiling.